Enjoy fun games at a princess party. A royal celebration isn't complete without the proper princess party games for guests to share. 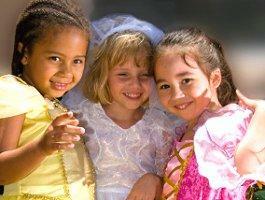 Fortunately, there are many ways to bring fairy tale magic to life at a princess party. Every young girl dreams about being a princess and enjoying the royal glamour that comes naturally to fairy tale heroines. A princess party can be a wonderful celebration for young girls, typically between the ages of 4 and 8 years old, allowing them to indulge in their magical fantasies in safe and fun ways. Whatever theme or specific princess the party will incorporate, there are fun party games available to add even more royal magic to the event. Dress Up: A pile of sparkling tiaras, fancy dresses, high heeled shoes, and costume jewelry can turn every party guest into a fabulous princess. Piñatas: A castle, crown, or dragon piñata will match the princess theme, and filling it with plastic jewelry as well as tasty treats adds even more royal flair. Kiss the Prince: This variation of Pin the Tail on the Donkey involves bright lipstick and a poster of a handsome prince for each party guest to try and kiss after they have been spun around or blindfolded. Makeovers: Turn ordinary maidens into extraordinary princesses with fun makeovers, including makeup, new hair styles, and glittery jewelry. Find the Slipper: This search for Cinderella's lost slipper is a scavenger hunt for royal treasure. In addition to a slipper, hide other royal items such as a scepter, tiara, rings, bracelets, and other fancy accents for guests to find. Musical Tiaras: Place a selection of tiaras on a table for guests to walk around as the music plays. When the music stops, the scramble begins to wear a tiara, and guests without one can become judges or help control the music until the game is finished. Crafts: Many craft projects can be coordinated for a princess party. Guests could decorate their own tiaras with stick on gems and glittery paint, or they could make fairy princess wands or royal friendship bracelets. Decorating castle cookies is another fun and tasty option. Hot Slipper: Like hot potato, the object of this game is to pass a princess slipper around the circle of guests until the music stops. The person left holding the slipper is temporarily out of the game. For a more difficult challenge, require guests to put on and take off the slipper while passing it. Story Time: Younger party guests can enjoy a quiet story time with a classic princess fairy tale. Choose stories such as "The Princess and the Pea," "The 12 Dancing Princesses," or other less well-known fairy tales to keep guests' attention riveted with a new story. Royal Tea Party: A princess tea party is a fun game for young guests. Use pretty dishes and treats decorated with edible glitter or colored sprinkles for a royally festive occasion. Happily Ever After Match: Create paired pictures of individual princes and princesses and arrange them in a Concentration-style matching game. Include popular royal couples as well as whimsical couples such as two kittens with crowns for even more variation. Find the Pea: If guests are familiar with the tale of "The Princess and the Pea," this game will be a fun activity. Place a green tennis or golf ball under one of several different pillows and cushions, and invite guests to sit on each one to try and find out where the "pea" is located. 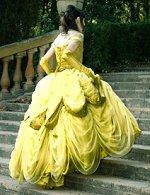 Real Princesses: Many private party companies offer the hostess services of "real" princesses for children's parties. These princesses come in costume and help coordinate activities and games while serving as a royal role model for younger guests. Prizes make party games fun and give guests mementos of the occasion. All guests should receive some small prize for participating in the games so no one feels left out, though winning guests could receive a larger or more elaborate prize. If a guest wins one game, they could help judge the next game to ensure that other guests have the opportunity to win as well. Princess party games and activities keep guests entertained and create an enjoyable fairy tale atmosphere for a royal celebration that will help friendships last happily ever after.